This is a tough week for me. After 14 years with al.com, this week is my last. As al.com, The Birmingham News, The Huntsville Times, and the Press-Register close shop September 30 and reform as a single company October 1, I will not be along for the ride. I've kept the news fairly quiet up until now because it hurts. It has hurt for the past three months since I found out. But as much as it stings, I'm not angry. I bear my colleagues and the new Alabama Media Group no ill will. The reformation they're undergoing is a bold and exciting one. I personally think that not only is it going to work, but that it will serve as a model for other news media companies. Advance Digital (the parent company of al.com/Alabama Media Group) is looking two or three years down the line and implementing those future ideals now. 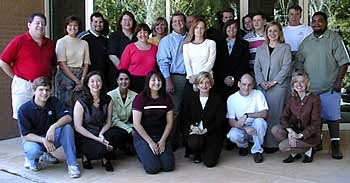 The al.com (then Alabama Live) staff from way back when. Nevertheless, it's been hard watching others around me prepare for this dramatic shift in our company. It feels like I'm the kid not invited to the party. Some of my coworkers don't even realize that I won't be a part of the new company. Making smalltalk the other day one of them quipped, "You getting all packed up?" "Working on it," I replied, not bothering to add, "but my boxes aren't going to the new office; they're going home." In all the talk of people at the newspapers losing their jobs in this transition, few have recognized the fact that some of us at al.com were affected, too. As I've slowly shared my personal situation with others, most have responded in shock. Quite a few times I've heard, "I can't believe they'd let you go!" And I appreciate that. But every time, I remind others that 400 people are being let go. I can't believe a lot of them didn't make the cut, either. At least I'm in good company. 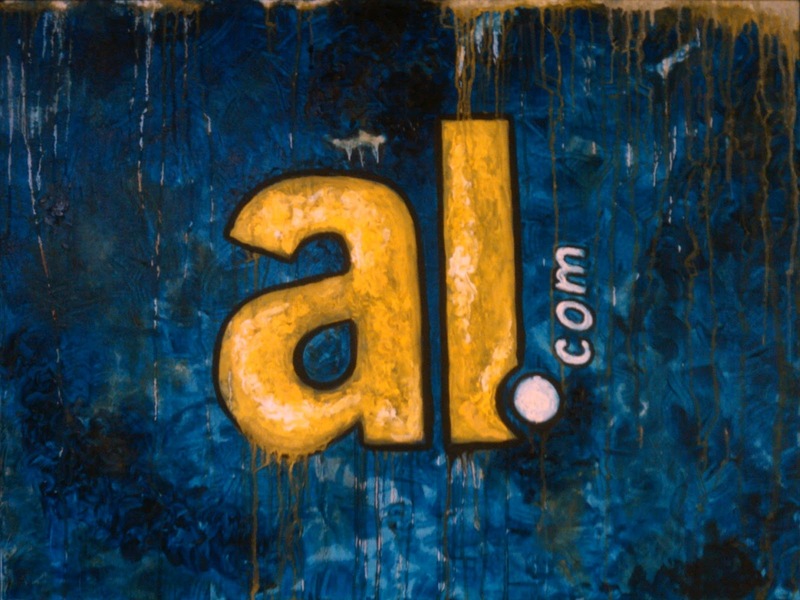 al.com has undergone a multitude of changes since I started in 1998 -- from site design to expansion markets to the way we gather and report news. In fact, al.com is pretty much in a constant state of change. That's the nature of the internet. 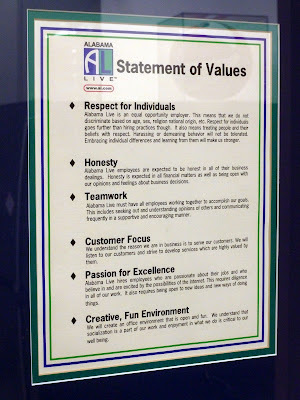 I've watched so many people come and go from al.com over time, but I've stayed for 14 years because I've liked the company, I've loved my coworkers, and I've enjoyed the work that I do. In fact, only our CEO and our office manager have been with the company longer than me. I have always been proud to work at al.com. 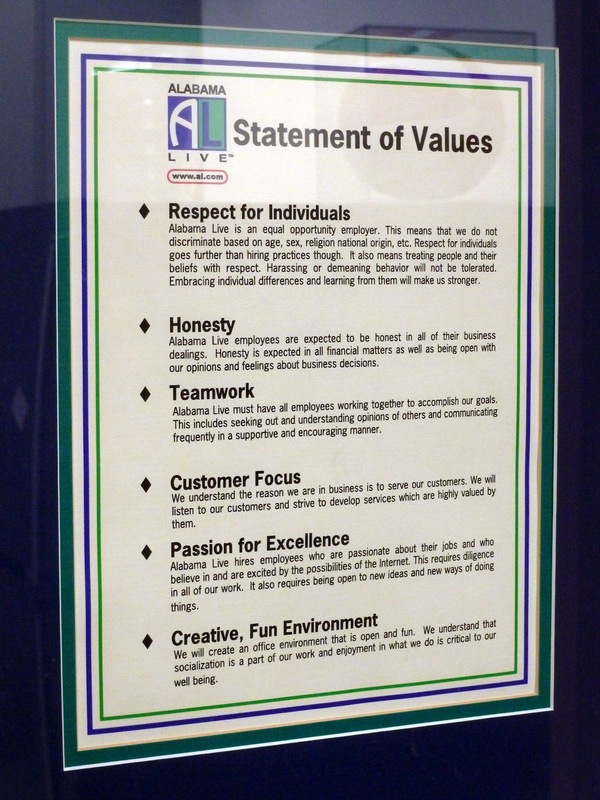 The old Alabama Live Statement of Values framed on the office wall has held true: respect for individuals, honesty, teamwork, customer focus, passion for excellence, and creative, fun environment. I can only hope that wherever I land next can match such standards. To my colleagues who are moving on to the new company with Alabama Media Group, I wish you the best of luck. I will miss working with y'all. To those who won't have a place to work starting October 1 -- and between al.com, The Birmingham News, The Huntsville Times, the Press-Register, The Mississippi Press, The Times Picayune, and nola.com, there are a lot of them -- you remain in my prayers. To my friends who have reached out to me with job leads, references, recommendations, and prayers, you have my sincere gratitude. Keeping a positive outlook has been a challenge, and the support of my friends and family has been invaluable. Matt, this is an awesome post. I am amazed you kept the news quiet to your coworkers. Being a proud alum of Alabama Live for the entire calendar year of 1998, I was always impressed that the folks at Advance Internet (known by that name back then) were so far ahead. Heck, we did things in 1998 that some companies are just starting to do now. I enjoyed working with you and wish you the best. My company let me go in January, so it's been a difficult road for me. I went into the process very naive and wasted some valuable time. I am confident you will NOT make the same mistake as I did. Best wishes to you, some company will be very fortunate to add you to their team! Matt, I've been where you are, so I understand some of what you've been and are going through. I wish you the best in the next chapter, and I'll be happy to lend a hand however I can. Matt, I can't tell you how much I enjoyed working with over my two stints at al.com. With your expertise and passion, I know you'll land somewhere great for the next chapter. You've been a huge part of what's kept AL.com relevant, Matt, and (ironically) I think much of their new digital focus owes its viability to your hard work. That said, I'm excited to see where you go next. You've got a lot of talents, and you're one of the best guys I've met in Birmingham. Congratulations matt on your success and your willingness to be so open about your feelings on the transition. Your hard work set the foundation for others to stand on your shoulders and wherever you end up next you will bring a wealth of knowledge and success to your new role. Though I rarely speak up publicly, I have always admired your professionalism and your graciousness. Best wishes on your professional future. I agree with everyone's comments about your professionalism, success, and attitude. Takes a lot of courage to share your feelings openly -- kudos to you for doing that. You're going to shine no matter where you land. That will be lucky group of folks. Please holler if I can do anything to help. Matt, I wish you tremendous success in whatever you choose to do. It's been my pleasure to work with you. Matt, you've always been extremely helpful to me in my short time here. I ALWAYS learned new things from you, and I feel I've gotten better because of working with you. Thanks for everything. Good luck! I am so grateful for the outpouring of comments here, as well as on Facebook and Twitter. Your words mean a lot, and I've found it difficult to avoid tearing up with so many kind responses. It's a good thing I posted this today, because tomorrow it'll be even harder. Thank you, everyone, for your support. Matt, I'm one of the people who didn't know you weren't staying. I asked the day announcements were made, but when I didn't hear back from anyone in Huntsville, I assumed you were staying. I am so, so sorry to hear this. You are tremendous asset to al.com, and your presence will be truly missed. I'm so thankful for the opportunity to have worked with you, and because I've seen your skill and work ethic, I have no doubt you will find a wonderful opportunity. I've always been impressed with your work, and even today, I'm impressed by your kind and thoughtful words about the new company. You'll be in my prayers, and I hope nothing but good things for you and Misty. Matt, as one who toiled the night away in the Production building, helping to keep the big greasy monsters running for 7 1/2 years, I fully understand how you feel. I've been down this road a couple of times in my 36 year career in printing. It's never easy but you show the positive outlook of one who, I feel, will make something good come of this. God bless you and I wish you the best of luck in the next chapter of your life. Keep your chin up, Misty smiling and the girls laughing. Everything else works out. Best of luck at landing on your feet.